What does the Rain Forest Zone Mean to You? These reflections are offered by individuals involved in studying and protecting the native ecosystems of Haleakalā. Lilinoe—a cool caressing mist, at times opaque and others rainbow-hued. Huʻihuʻi—frosty icicles exuding the spectrum of color from leaves of red and green. Located between 600 meters (1968 feet) and about 1900 meters (6232 feet) elevation on the windward slopes of Haleakalā. Rainfall in this zone is over 200 centimeters (80 inches) per year. A continuous canopy layer covers lower subcanopy trees and understory trees and shrubs, and a ground cover layer of herbs and ferns. Epiphytes and climbing vines and shrubs are common. Unlike other parts of the island, there is not a distinct dry period during the year. Rain normally falls year-round as a result of moisture-laden northeast trade winds that predominate for most of the year. In some parts of the Haleakalā rain forest, rainfall can exceed 1000 centimeters (390 inches) per year. The highest rainfall ever recorded in the Haleakalā rain forest was at Kīpahulu Valley in 1994 when a rain gauge measured 14 meters (551 inches) of rain in a single year! Sixty billion gallons of surface water per year from this part of East Maui already provide much of Upcountry and East Maui drinking water and most of the irrigation water that goes to the Hawaiian Commercial & Sugar Company in Central Maui. The native Hawaiian rain forest on Haleakalā once extended from just above the coast up to approximately 2500 m (8200 ft). Much of the lower-elevation rain forest has been extensively altered by cultivation, logging, and introduced plant and animal species. The upper rain forests are a refuge for many species of native birds, insects, and plants. 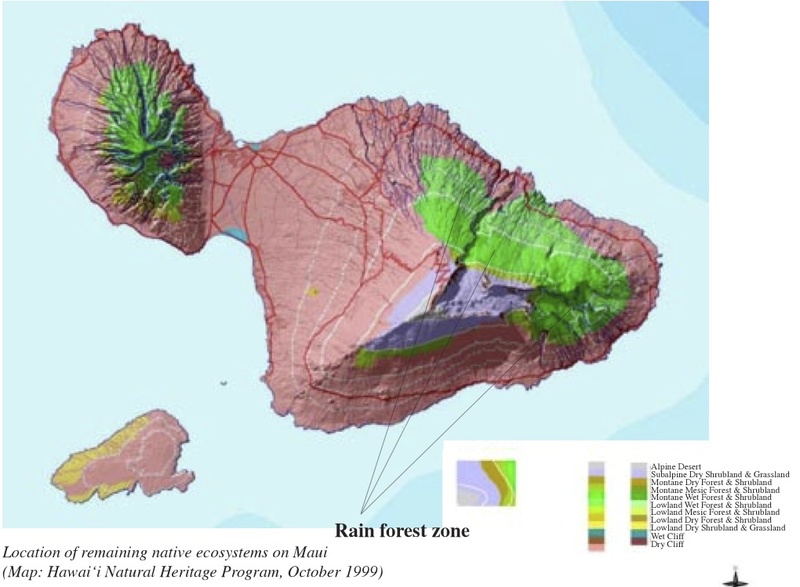 Much of the remaining native rain forest on East Maui is designated as national park, private preserves, and state natural area reserve and forest reserves. Threats to native rain forest communities include Axis deer, mongooses, black and Polynesian rats, and mice; feral pigs, goats, and cats; nonnative slugs; a number of introduced, invasive plants; and diseases that threaten native birds. These introduced species prey upon and compete with natives, degrade habitat, and restrict the range of many native species to smaller and smaller areas. In the traditional system of dividing the Hawaiian Islands into political regions, the ahupuaʻa was the most important land division. Ahupuaʻa usually extended from the mountains to the outer edge of the reef in the ocean, cutting through all of the major environmental zones along the way. Each ahupuaʻa encompassed most of the resources Hawaiians required for survival, from fresh water to wild and cultivated plants, to land and sea creatures. Because of their dependence on the land’s resources, the Hawaiians developed a complex system of resource management and conservation that could sustain those resources over time. This system was tied intimately to the religious and cultural beliefs of the Hawaiian people. In Hawaiian tradition, the upper reaches of the native rain forest were wao akua, the realm of Kū, god of war, governance, and upright growth. Humans could only enter this sacred area for specific purposes and with permission from the gods. Below the wao akua is the wao kānaka, where people lived, worked, and cultivated their crops. Among those who were allowed to enter the wao akua were the skilled kia manu (bird catchers). Colorful feathers from native forest birds were fashioned into lei, capes, and ceremonial helmets for the aliʻi. The trained kia manu captured birds, plucked the desired feathers, and then released the birds. Rain forests were also the source of koa logs and other wood necessary for making traditional canoes. From the rain forest came plants used for fiber, weaving, kapa cloth, and medicines. In the lower-elevation wao kānaka area of the rain forest, kalo or taro was grown as a food staple, planted along streams and drainages where it would grow naturally. Today, kalo continues to be an important part of the culture of Hawaiʻi. The ancient Hawaiians depended upon the rain forests for food, clothing, medicine, transportation, and building materials. They realized that their physical and spiritual well-being depended upon perpetuating these resources and maintaining a respect for the land. • Listen to the chant. How would you describe the feeling of the chant? What did it make you think about? • Listen to the English translation of the chant. Do you have different thoughts and feelings now that you know what this chant means in English? • Have you ever been to the rain forest? What are your impressions of this area? • What comes to mind when you think about the rain forest? What are your memories or observations of this ecosystem? The “Rain Forest Slide Show” (Unit 2, Activity #1 “Rain Forest Slide Show”) helps students visualize the rain forest and learn about basic human connections to and impacts on the Haleakalā rain forest. You may use it as an introduction for any unit or activity if you are not using Unit 2.